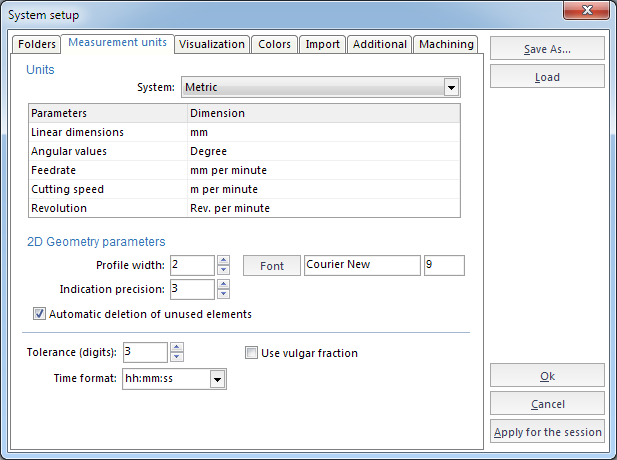 Allow define measurement units for the system and configuration for visual parameters for 2D geometry mode. Measurements are based on the units used in the imported model. Output data (NC) is created using the same units. Consequently, in order to obtain an NC program for a CNC milling unit in millimeters (inches), all measurements of a model must be in millimeters (inches). Angular measurements are given in degrees with decimals. In the <Profile width> field the line width is set, shown on the screen, in pixels. In the <Indication precision> field the number of digits after a comma of the current coordinates are set. To assign the font of the debugger window text press the <Font> button. <Automatic deletion of unused elements> allows to automatic delete intermediate simple 2D-elements which are not used for other elements construction. The cleaning action starts when the 2D-Geometry mode is closing. The <Default parameters> panel defines a file with description of initial parameters for new operations. The <Edit> button opens a window for the file editing. The <Tolerance (digits)> value defines digits count after decimal separator for values which are outputted into the NC-program. It is recommended to set the value to equal or greater for one than the maximal NC-machine tolerance (or digits count after decimal separator for the NC-program). The <Time format> field defines a format for the time output (for the machining time for example). The <Use vulgar fraction> – using in system vulgar fraction.